The Mae Hong Son Loop is a 600 kilometer route through northeast Thailand, close to the Myanmar border. The route can be completed in as few as 3 days, but stopping to spend more time in some of the awesome towns along the way is definitely worthwhile. 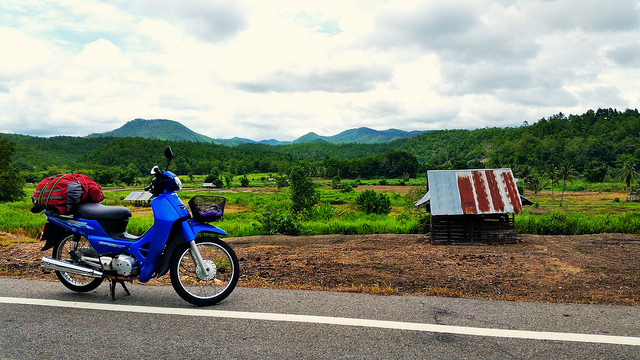 Rent motorbikes (make sure to get semi-automatic for the hills) in Chiang Mai and head southeast to Mae Sariang, then Mae Hong Son, and finally to Pai before returning to Chiang Mai. You'll ride through lush jungles, beautiful mountains, and spectacular valleys along the way, but be careful as the winding roads can be dangerous at times (check out our experience on the blog, but don't let it scare you away!). All told, a must do experience in northern Thailand. Take your time. Spend at least 1-2 nights in Mae Sariang, Mae Hong Son and Pai (or add on Chaing Dao) You'll want to break up the time riding and have flexibility in case of bad weather. Go clockwise (Mae Sariang as your first stop after Chiang Mai) to get used to riding on long flat roads before the curves of the mountains. (The road from Pai to Chiang Mai has 762 steep curves, so you'll want to be ready).